George D. Wetherill & Co. Prior to the Civil War, painting one’s house was an arduous and uncertain undertaking. The can of paint, which we take for granted today, had not yet been invented. Instead, interior and exterior paints were made in small batches by combining dry pigments with lead and oil in varying quantities, resulting in poor quality paints and inconsistent colors. Starting in the 1860s and 1870s, innovations such as improved methods for grinding and mixing pigments with oils, and the invention of the paint can with an easily removable and re-sealable lid, fueled the rapid growth of large scale paint manufacturing in America. Consumers suddenly had access to convenient, ready-mixed paints of consistent quality and a wide array of colors previously unimagined. Factories sprang up in industrial centers of the Northeast and Midwest to meet the growing demand for paint and varnish. 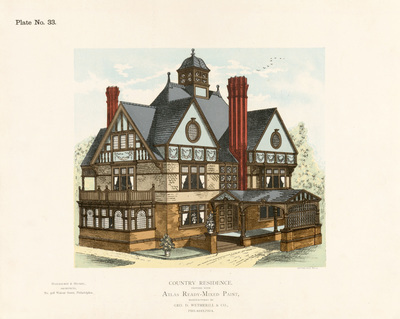 Paint manufacturers utilized the growing railroad network to distribute their products, along with advertising brochures featuring full color paint samples to entice the homeowner. This exhibition of advertising signs from the late 19th and early 20th centuries represents a small portion of the historical paint research collection at The Athenaeum of Philadelphia. In addition to signs, the collection also includes more than 450 items such as brochures, trade catalogs, color samples, and related materials that document the rapid growth and exuberant promotion of the paint industry. Some of the paint company names are familiar; many other companies, with names now obscure, eventually fell by the wayside or were bought out by larger corporations. The invaluable collection from which this exhibition is drawn exists largely through the efforts of former Athenaeum Executive Director Dr. Roger W. Moss, whose extensive research and writing forms the foundation of historic paint study in America. Original exhibition dates: January 15 - April 22, 2016, in the Dorothy W. & F. Otto Haas Gallery of the Athenaeum of Philadelphia. Original exhibition and online exhibition curated by Denise R. Fox. View photos of the exhibit. Note: This online exhibition contains additional information not included in the original exhibition.